How are ashes turned into diamonds? “Why?” you might ask. Well, the short answer is because diamonds are forever. Therefore, when my remains are transformed into a stunning diamond, an actual part of me will carry on forever. My memory. My legacy. Even the carbon from my body will be made eternal when my loved ones have my ashes turned into a diamond. My name is Anna Maria, and I have made the decision to be turned into a diamond when I die. I have already taken out an end-of-life insurance policy that will cover the entire cost of the process. When I took out this insurance plan, I was shocked to discover that that the cost of cremation combined with price of the diamond is either less than or comparable to the typical cost of a funeral. To me, that is the difference between paying for something that afterwards leaves my loved ones with nothing more than a memory, versus paying for a service that creates something permanent containing part of me that can stay close to my loved ones forever. I am going to explain how the process works and why I believe this cremorial, or gift made out of the cremated remains of a loved one, is a beautiful option to preserve a piece of them for generations to come. The process behind the creation of diamonds from human remains or hair is fairly straight-forward, because both natural and artificial diamonds are comprised of the same substance, carbon. In fact, the element carbon makes up approximately 18 percent of the human body. In nature, diamonds are formed when carbon within the ground is subjected to tremendous amounts of heat and pressure. Diamonds that are grown in a laboratory are made by creating these same conditions artificially. First, heat is applied to the ashes or hair at incredibly high temperatures in order to extract the carbon. The carbon is then added to a diamond growing foundation. This crystalline matrix is what grows into a unique and personalized diamond. Next, the mixture is placed into a high-pressure, high-temperature (HPHT) machine. This complex machinery recreates diamond-growing conditions found in earth. Inside, the temperatures rise in excess of 2000°C and there are more than 60,000 atmospheres of pressure applied to the matrix in order to grow the diamond. The result? A personalized diamond that is chemically indistinguishable from a natural stone. Plus, because every single person’s make-up of ashes is unique, the clarity, size, and exact color of the diamond will reflect the uniqueness of that person. 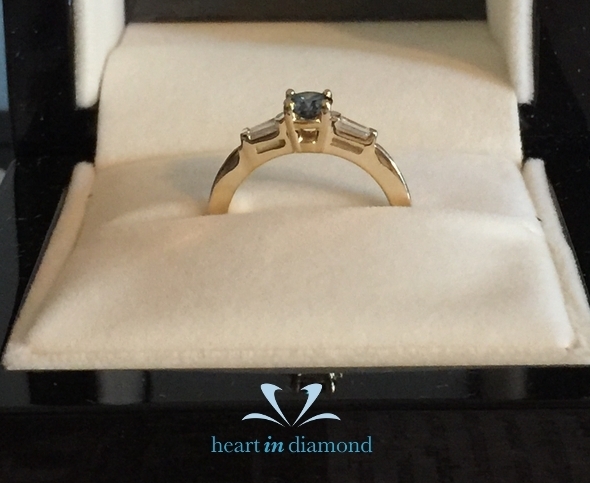 After the diamond crystal is formed, it is then cut and polished the same way a natural diamond is. I am no stranger to death and grief. My husband of nearly 50 years, Karl, died unexpectedly of a heart attack nearly a decade ago. At that time, I had never heard of memorial diamonds and I didn’t know there was a way to transform a part of Karl’s body into a keepsake that I could take with me wherever I go. Instead, I spread his ashes over the sea in a place that was special to us. This was the very place where he proposed, and later we were married. While the act was special and the location was extremely significant, it only lasted a moment. Afterwards, I had nothing left of his physical being to hold on to. I felt empty inside. I had mixed emotions about spreading his ashes in the first place, and now I regret that decision. There are times I wished I had just kept them in an urn in my home to remind me of him. These thoughts came before I knew about cremation diamonds. In hindsight, I know exactly what I should have done with my darling husband’s ashes. When I learned about Heart in Diamond and how they turn the cremated remains of loved ones into diamonds, I knew beyond a doubt that this was what I want to happen to me when I die. I believe our only child, my daughter Brandy, will cherish the diamond. She can have it made into a beautiful piece of jewelry, and pass it down from generation to generation. In order to personalize the experience, the type of diamond and the jewelry setting (if she wishes) will be her decisions. I want her to choose whatever stone and setting will be the most significant for her in honor of my memory. My entire life, I have been a pretty frugal spender, so it came as a bit of a shock to my daughter when I told her that I wanted to be turned into a diamond! However, when we added up the expense of being cremated combined with having my remains turned into a lifelong treasure, and compared them to the cost of a traditional funeral, the options were very similar in price. To me the choice is clear. I want to shine forever. I want to be around forever. I want to be brilliant. I want to be bright. Being turned into a diamond accomplishes all these things and more. I am confident that my daughter will be able to cherish this keepsake, and not feel alone and empty like I did after scattering the ashes of my late husband.